Everyone has heard of the Great Wall of China and knows of Hadrian’s Wall and the other barriers lining stretches of Rome’s imperial frontiers. 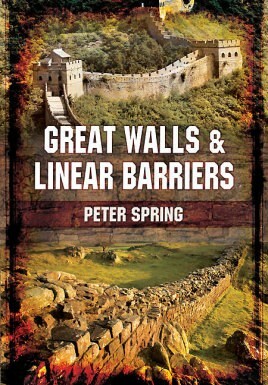 But Peter Spring’s original new study demonstrates that far from being exceptional, the building of walls and other linear defenses was commonplace among the peoples and states of pre-modern era. He finds examples virtually all across the globe and analyses their forms and strategic functions. He finds patterns for their distribution, an important recurrent theme being the divide between settled agriculture and nomads. The author argues that it is mistaken to view such undertakings as necessarily purely defensive measures that might be evidence of insecurity or a ‘maginot line mentality’, as they were in fact often about aggressive assertion of control over a region or strategic routes. This original and thought-provoking study brings new light and insight to a fascinating and neglected aspect of human political and military history. It The clear text is supported by numerous, specially drawn maps and photographs. PETER SPRING is a financial consultant by training. He has a BA in Modern History from Royal Holloway College and an MA in Medieval Art History from the Courtauld Institute. He lives in southwest London. His first book, Great Walls and Linear Barriers, was published by Pen & Sword in 2015.